Surprisingly little has been written about Eddie Lang, the great guitarist of the 1920s. Popular musicians of the era have said Lang was the musician who "first elevated the guitar and made it artistic." There was good reason for Lange's virtuosity as he was introduced to the instrument at a very early age. . . his father was a guitar and banjo maker in Philadelphia, PA. While it wasn't the hub of music in the 1920s, Atlantic City played home to many influential jazz musicians. Lang went there to practice his chops and sit in with other up-and-coming artists like Russ Morgan and the Dorsey brothers. The jazz guitar was not common in this era of drums, brass and woodwinds. Lang's unique sound fleshed out and completed the sound of these common instruments with it's ability to integrate harmoniously. By 1925 Lang and Joe Venuti, his best lifelong friend and violin player, were in high demand up and down the East Coast. 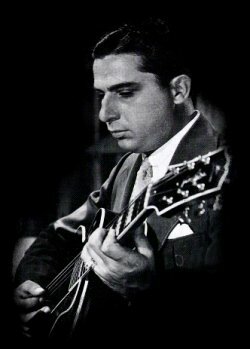 Their unique sound can be heard on the track "After You've Gone"
Many composers, spurred by Eddie Lang and Venuti's melodies began to see the enormous potential for jazz guitar, and the instrument's ability to add a dynamic harmony and flexibility to any group's sound. Because of Lang's talent, well-known jazz groups like "The Five Pennies" (aka The Redheads) feverishly sought to employee Eddie Lang. At this young point in jazz as the musical "sound" was still being sought; the sound of jazz was ever-changing with the widespread experimentation of the 1920s. In 1927, Lang and Bix Beiderbecke teamed up in a series of great recordings. The most famous of these were, "Stringing the Blues" and "I'm Coming Virginia"
In the years preceding his death, Lang played at the height of his powers with many musicians at the height of their own: Beiderbecke, Benny Goodman, Jack Teagarden and many others. Lang died of complications to a tonsillectomy. He had had a chronic sore throat for several years and his friends had encouraged him to have it worked on. While not the first name of 1920s jazz, his legend lives on in the sound and the many great recordings with artists like Beiderbecke and Bessie Smith.